Seashell Cottage @ Coco Bay, à 180 degrés des vues spectaculaires sur l'océan! Notre récent chalet, le Seashell, est situé directement sur l'océan. 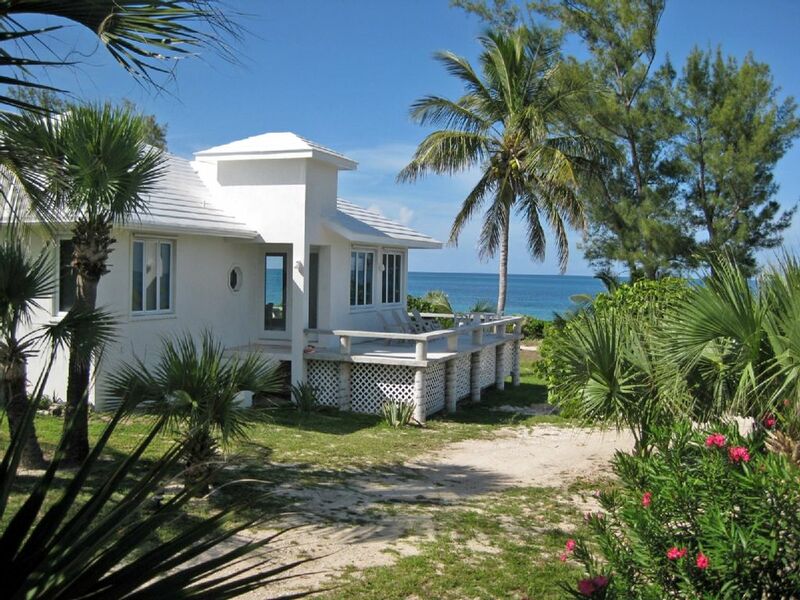 Les Cocobay Cottages offre 6 chalets sur 6 acres de terres situées au point de Green Turtle Cay plus étroite dans la région isolée et souhaitable Coco Bay. La propriété est parsemée de palmiers et de fruits, ce qui rend chaque chalet très privé et offre de belles vues sur l'océan et le jardin. Un dock est à votre disposition pour location de bateaux jusqu'à 30 pieds. Il ya 5 îles inhabitées dans les 20 minutes de la station d'accueil. Vous pouvez également choisir de louer une voiturette de golf au cours de votre séjour pour explorer l'île et utiliser comme moyen de transport. Le gîte dispose de grands porches enveloppants avec une vue à 180 degrés spectaculaires sur l'océan! L'intérieur est décoré avec des meubles en rotin, il offre TV / DVD, une station iPod, A / C, cuisine complète avec des appareils en acier inoxydable, il a été achevé en 2009. Chaque chambre dispose d'une vue sur la mer! Nous avons 70% de répétition clientèle. Venez vous détendre dans notre hamac en bord de mer pour un changement de rythme! Les invités sont accueillis à l'ferry et présentés à leur chalet. Une voiturette de golf est fortement recommandé pendant votre séjour ou au moins une location de bateau. Nous sommes situés à 3 miles du village de New Plymouth et moins d'un mile de la boutique de plongée de la Green Turtle Club et Brendal. Croisière autour de l'île sur une voiturette de golf et l'arrêt à des plages isolées est une joie! Il ya un téléphone Vonage disponible pour les appels internationaux / locaux pour 1. 00 Un appel .... une grande économie de l'Internationale de l'appel de téléphone cellulaire, WiFi gratuit connexion Internet disponible à partir de chaque chalet. Questions, problèmes sont répondus par le propriétaire ou le gestionnaire de résident. La propriété dispose de plus de 75% de la clientèle répétition. Beautiful property on the north end of the island. Offered just the right amount of seclusion we were looking for, while providing our children Wi-Fi in order for them to stay in touch with their friends. Out the front door you have an amazing beach with one of the most beautiful reef systems I have ever dove or snorkeled. Out the back door you have a beautiful bayside beach (Coco Bay), filled with sea turtles, rays, and lots of other sea life. We swam with and fed the turtles on several occasions. My husband and I took our 6 adult children for a family vacation, fun was had by all, and many wonderful memories were made. Thank you Nicole and Carol for your help with everything. It was a pleasure hosting you . We are sorry that we were not in residence during your stay , but our property manager is a gem and a such a good host . I know that the purpose of your trip was to celebrate more than one graduation in. your family , Congratulation to you and your wonderful family ! We rented two of these houses here at Cocobay for a week with friends. Cocobay cottages offered us exactly what we were looking for, location, dockage, two beaches, a calm one, and then the one on the atlantic side (with an amazing reef!) and great hospitality. Our cottages were perfect for all the cooking at home we did, with the lobsters that we caught steps away at the reef on our beach. The property owners were happy to help us out with any thing we needed, helping us with our golf cart rental, a fishing guide, and getting us to the ferry dock on our last day. The houses were fully equipped with anything and everything you needed to cook amazing meals and breakfasts, great washer and dryers, which is key when you have family and don't want to pack tons of stuff, and the air conditioning and TV's worked great so we could tune into the Olympics as they aired. Cocobay is very close to the Green Turtle Club and New Plymouth, so any place we needed to go was only ten minutes away. We spent time at Guana Cay and Spanish Cay and also did much fishing and diving. So having our boat docked right in Cocobay was simply amazing. We would definitely stay here again. If you're looking for a place were you can have it all, this is it. Nicole and Larry were great hosts. We were met on their docks and they had everything ready for us including the golf carts we rented. Our house had a amazing view of the beach/ocean (30 feet from our house) and it was only a short walk (maybe 200 feet) to the bay where we docked our boat. We snorkeled the amazing reef about 70 yard off our beach - and saw all sorts of coral and tropical fish (the reef was incredible and huge - it went forever). Also, we speared 5 lobsters just off their beach on our first day! Nicole and Larry helped us find a fishing/spear fishing guide that helped us catch plenty of strawberry/mutton groupers, yellowtails and lobsters. Larry told us where to conch and the kids had a great time diving down for conch. The houses were clean, fully equipped and comfortably decorated. We cooked a lot (of our catch!) and the kitchen had everything we needed to prepare the food. Beds were comfortable. Only problem was that the dishwasher broke and they couldn't repair it during our stay - Nicole and Larry bought us plenty of paper plates, etc. so we wouldn't need to wash dishes. There is a wifi house that works well. Its a 5 minute golf cart ride to Green Turtle club (good restaurant and bar) and 10- 15 minutes to New Plymouth (more restaurants, grocery, bars etc). Green Turtle is a great choice for the Abacos because you can fly in to Treasure Cay airport and its a 5 minute ferry to Green turtle. It is not very crowded and you can really feel like you are getting away. Also because its more isolated, the fishing/lobstering is plentiful. We had friends staying in the house next to ours. We truly enjoyed the property and the accommodations. It is a really special place. We have stayed here many times over the years and absolutely love it. If you want a vacation where you truly leave all your stress behind, this is where you need to stay. Great property! We loved it! Beautiful houses and beach! Best spot on the island! Plenty to do on the for everyone. Owners are great and can answer any question you might have. Wouldn't consider giving any rating other than five stars! It's been such a pleasure to have you and your family ( now 3 generations ! )vacationing with us over the years .and to share our unique corner of paradise . The location was great but that was about the only thing we liked about the house. We never received a key to lock up our personal belongings while we spent our days out on the water, fishing and diving The house was gross. The furniture had blood stains on it, the blinds were destroyed and literally dangling on the windows. The ad stated that there would be wifi, a grill and a coffee maker. The house did not have any of these items. Additionally, there were no trash bags, paper towels or toilet paper in the house. For the amount of money we spent, we were extremely disappointed in the house. I wouldn't recommend it to anyone. Ouch ! After 31 years and 75% repeat clients , I would like to address MR. K . Comments. WE have NEVER given keys to the cottages but had discussd changing our policy because most people these days travel with expensive electronics. We now offer keys . He is right about the broken mini blinds, we brought some over ( by plane ) and were replaced immediately .we do have rust spot on some items, we are located Directly ON the ocean . When Mr. K was visiting , the Internet service island wide was down for 2 to 3 days . Everyone in Abaco was impacted ..thankfully it does not happen often and most time , just for a few hours . With communications down, it became difficult to get in touch with our property manager .... We do offer FREE wifi , it's located centrally on the property and housed in the rec center where you find comfortable chairs ,paper & pens . It does not always reach inside the cottages ...but is only a minute away . My property manager showed Him the grill and even added an extra gas tank because the one attached was low . We were unaware of the malfunctioning coffee. Maker. We had replacements . Finally, when I found out from Mr. K That he was coming with Vets on a fishing fun trip. I donated a couple of golf carts for their use . He also left an expensive fishing pole behind and we made arrangememt to send it back to the States with another trusted client to get it back to him . We offer personal service to all our clients ,but sometime , especially on an island 200 miles miles at sea , it is more difficult to fix something immediately ...but any and all issues are taken care of . We appreciate the comments , you cannot fix what you don't know . The next clients in the same cottage were on their 25th visit with us ! Nous avons plage sur 2 côtés, bonefishing et promenades sur la plage sur les appartements Coco Bay et un récif pour la plongée sous-marine ou à votre porte, Oceanside. Impuretés Gratuit pour bateaux jusqu'à 30 pieds. Seaglass et coquillages sont abondants, des miles de plages isolées et un hamac privé vous attend! Des vues spectaculaires sur l'océan, Venez le lever du soleil sur l'océan et situé sur la baie! The nightly rate is 500.00 for up to 4 people and 600.00 for up to 8. The weekly rate is 3500 for up to 4 people in the cottage and 4000 per week for 5 to 8 people . Children counts as adults, we offer free porta-cribs for babies [up to 2 years old, free]. A 10% Bahamian resort tax applies .